H.O.G.® IS THE LARGEST FACTORY SPONSORED (HARLEY-DAVIDSON® MOTOR COMPANY) MOTORCYCLE ASSOCIATION IN THE WORLD. H.O.G.® ORIGINATED IN 1983 AND HAS GROWN TO OVER ONE MILLION MEMBERS IN MORE THAN 1400 CHAPTERS IN OVER 70 COUNTRIES. ALL RIDERS AND MAKES OF MOTORCYCLES ARE WELCOME!! 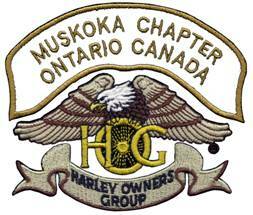 THE POKER RUN WILL COMMENCE WITH ALL RIDERS PAYING A REGISTRATION FEE (PRIOR TO COMMENCING THE RIDE) AT ANNIE WILLIAMS PARK IN BRACEBRIDGE, AFTER WHICH WE WILL BE RIDING A PREDETERMINED ROUTE THROUGH THE MUSKOKA AREA AND CONCLUDING BACK AT ANNIE WILLIAMS FOR SAUSAGES, HAMBURGS AND HOTDOGS.